Lobia | karamani | cowpeas generally we make sundal and add in karadaiyan nombu adai. I have a pack of karamani lying with me after the nombu. I remembered that my friend anita used to make vadai with that and they call it as alasanda vada. 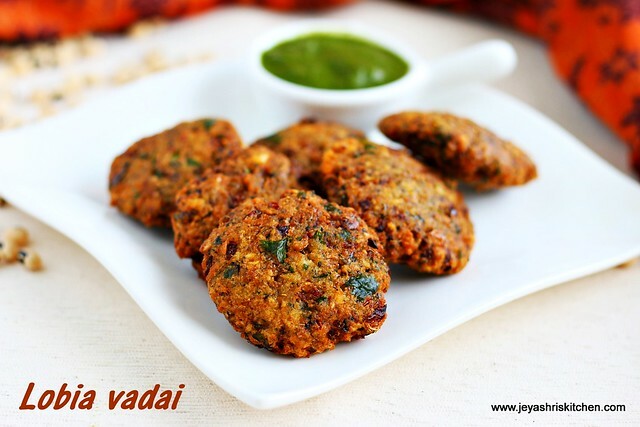 The vada was similar to the masala vadai we make but the soaking time was bit more than that. Actually i wanted to try out a cutlet | kebab recipe using lobia but made masala vadai. I am still having some cowpeas | black eyed beans with me. Will post it when i try it out. 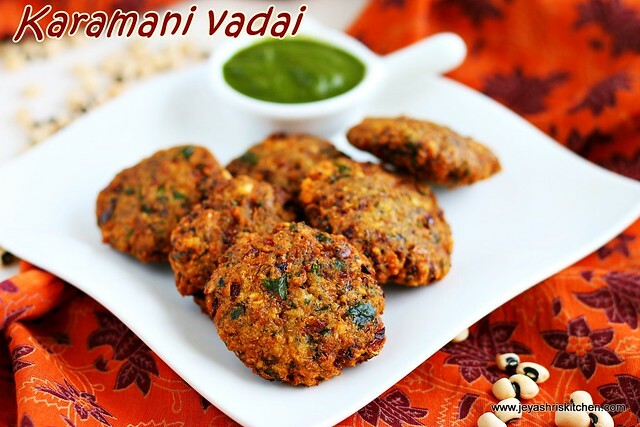 Make this karamani vadai for evening snack and enjoy your tea time. Preparation Time : 15 mins + 6 hours soaking time| Cooking Time : 25 Mins |Serves: 20 vadais approx. Soak the karamani overnight or 5-6 hours. Drain the water completely and grind this along with mint leaves,asafoetida,curry leaves,red chili . Grind this coarsely. Do not add water while grinding. If you feel the batter is too thick and the mixie is difficult to move, sprinkle little water. Transfer it to a bowl. You can keep this inside the refrigerator, if you want to make later. When you are about to make, add finely chopped onions and coriander leaves. Mix well with hands evenly. Heat oil. Take a lemon sized ball of the vada mixture and flatten it. Drop the flattened vadais into the oil and fry till golden brown. Drain in the kitchen towel. I missed to click the cooked vadais and realised it while editing the pictures. You can add finely grated carrots and cabbage. A small piece of ginger can be added while grinding. Few pods of garlic can also be added. Do not skip the coriander leaves and mint leaves.